If you have not heard of do88 it is likely because they are located in Sweden. They supply hoses and cooling packages to Koenigsegg so their stuff is engineered to a high performance level. 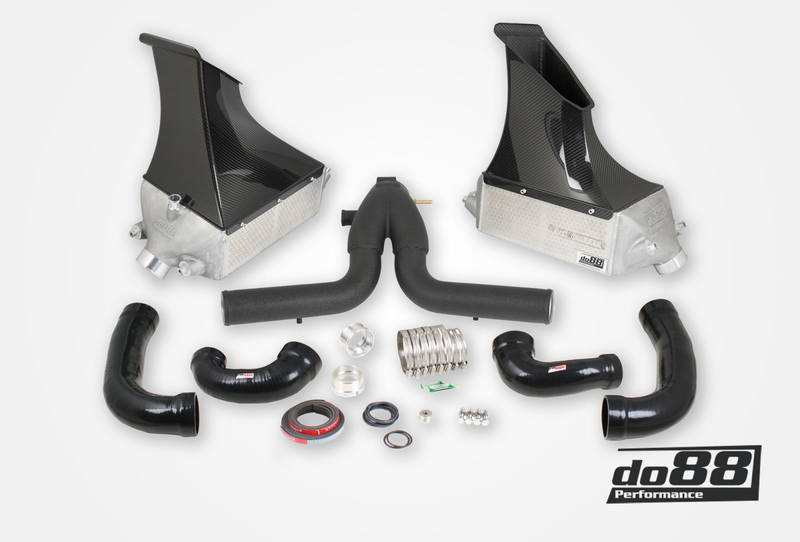 They just released an upgraded cooling and airflow package for the Porsche 991.1 and 991.2 Turbo models. Upgraded hoses, Y-pipe, intercoolers, and inlets. An appreciable difference for sure and a pressure drop of 2.54% which is great for efficiency as the turbos are not working as hard. That means less heat. The package retails for $4227 and it will be interesting to see if anyone in the US tries it out. - Highly improved airflow! (see diagram ). - Cooler air to your engine! (see diagram). - High-quality motorsport cell packages made in England. - 3D free-form designed cast tanks. - Custom designed carbon fiber air controls. - System airflow at 0.175bar / 2.54psi pressure drop: 790CFM (602CFM), do88 31% higher! Y-tube with softly designed cast collector part. - Supplied with high quality silicone hoses and accessories for assembly. Pricing is on point. Inlets are not in photo of what you get.